Pungency. A raw onion’s sharp, pungent bite comes from various organosulfur compounds, which the plant builds using sulfur pulled from soil. Their purpose is to serve as protection against predators; when the plant’s cell walls are damaged, enzymes convert the compounds into the volatile acids that make us onion choppers cry. When we eat these compounds, they modulate the activity of several enzymes that are involved in oxidative stress response and detoxification of carcinogens – similar in action to the sulfurous anti-cancer molecules in cruciferous vegetables! Sweetness. Onions are bulbs, meaning they are the plant’s solution for long-term storage of the energy it captures from sunlight. The onion converts solar energy into fructose sugars, then strings them together into long chains. When cooked slowly and gently, the chains break down and the sweetness is revealed. 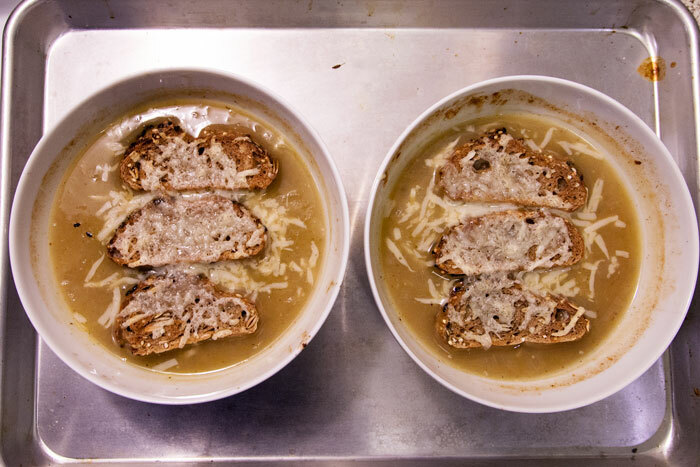 Which brings us to onion soup, a mid-winter wonder in which humble beginnings are conjured into something magically nourishing. Like many cooks, I cannot bear for my onion soup to stray too far from the classic… but I did want to involve my pressure cooker, so I’m sharing my methods for anyone else interested in another Julia-fueled Instant Pot adventure. Recipe from Mastering the Art of French Cooking, slightly tweaked and adapted for use in electric pressure cooker. Add the butter and olive oil into the pressure cooker, and select slow-cook mode to begin with a low heat (with Instant Pot, press "Slow Cook" and keep the default heat setting). When the butter is melted, add the sliced onions. Toss to coat the onions with the butter/oil, then cover the cooker with a lid and let them cook for 15 minutes without stirring. After 15 minutes, uncover the pot and raise the heat slightly (with Instant Pot, hit "Cancel," then "Saute," then the "Adjust" button twice to reduce the heat to low saute). Stir in the salt and sugar (if using) and let the onions cook, stirring occasionally, for at least 1 hour until they are thoroughly caramelized and golden (with Instant Pot, the maximum saute time is 30 minutes, so you will need to reset the cooking program halfway through). After the onions are caramelized, stir in the the flour. Cook for another 3-5 minutes to avoid a "raw flour" taste, then add the wine. While continuing to stir, slowly pour in the stock, then season to taste with salt and pepper. Finish the soup under pressure: cover the pressure cooker with the lid, ensuring that the valve is in sealed position. Cook under high pressure for 15 minutes (with Instant Pot, press ‘Cancel’ to stop saute mode before closing the lid, then choose ‘Manual’ mode, and adjust time to 15 minutes). When the cooking time is complete, allow the pot to de-pressurize naturally for at least 10 minutes before opening the lid. Check and adjust seasoning if needed. If desired, preheat your oven's broiler and finish with a cheesy gratinee topping: divide the soup into six oven-proof bowls, and stir 1 teaspoon grated onion and 1 tablespoon of grated cheese into each one. 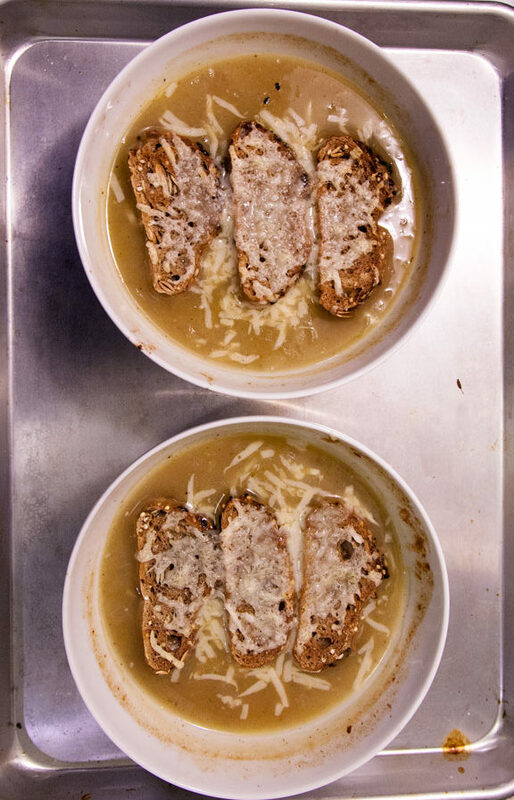 Float a few toasted bread slices atop each bowl, then mound more grated cheese on top. Arrange the bowls on a baking sheet and place under the broiler; watch closely and remove the tray as soon as the cheese is melted and lightly browned. Finish with a sprinkle of fresh parsley.